Milwaukee loves donuts. Dozens of bakeries in the city and its surrounding suburbs help people get a sweet start to their day with long johns, crullers, jellies, powdered, cream-filled, cake donuts, and more. If you’re looking for the “hole story” on Milwaukee-area breakfast pastries, let our weekly Dollars For Donuts column be your guide. 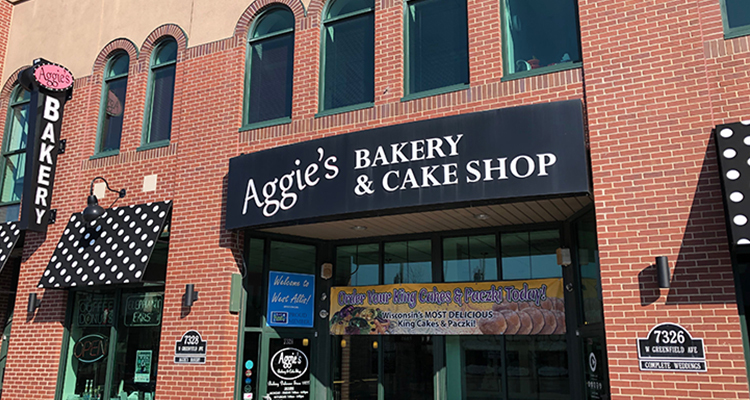 Aggie’s Bakery & Cake Shop (7328 W. Greenfield Ave., 414-482-1288) has been “baking delicious since 1977.” Over the course of its 42-year—and counting!—run, the family-owned bakery has been serving folks in its hometown of West Allis and people throughout Milwaukee a wide variety of baked goods, including pies, bars, cupcakes, cookies, and its specialty: cakes. Its cakes are elegant, innovative, and able to be crafted to suit any occasion imaginable. From cheesecakes and graduation cakes to specialty birthday cakes and pastries for gender reveals to massive multi-tiered wedding cakes, Aggie’s has made its case for the title of metro Milwaukee’s premier cake shop. Even though cakes, rightfully, take primary focus at Aggie’s, the West Allis mainstay also excels at the little things. On top of some of the aforementioned baked goods that aren’t set aside for holidays and other special occasions, Aggie’s also makes donuts fresh each and every day. Prices range from a dollar for cake ring donuts to $2 or $2.50 for specialty options. Half a dozen specialty donuts can be had for $12, and 12 top-tier donuts go for $20. Admittedly, this is a tad more pricey than some places we’ve previously visited, but they’re worth every penny. We recently stopped in and grabbed an assortment of Aggie’s donuts. Our order consisted of a raspberry filled, a vanilla frosted cake ring with sprinkles, a glazed ring, a chocolate long john filled with chocolate buttercream, a custard filled chocolate donut, and a maple bacon long john. The raspberry filled and custard were top-notch executions of donut shop standards. The glazed was soft, sugary, and sublime. The cake ring was also soft inside, with the added bonus of plentiful frosting and sprinkles that covered virtually every millimeter of frosting. One of the most memorable donuts in our batch was the long john. The lengthy piece of fried dough was topped with a generous smear of chocolate frosting. Unlike many of its long john contemporaries, Aggie’s long john was cut in two parts, which allowed for more cream filling to be piped between the two pieces. Speaking of the cream filling, it’s not your garden variety filling. Aggie’s famous and impossibly rich buttercream is sandwiched betwixt two donut portions. If chocolate isn’t your thing, there’s also a vanilla variation available. The buttercream long john was a surprising standout, but it paled in comparison to a different long john variation we had. Among the menagerie of specialty donuts on hand, Aggie’s offers a maple bacon long john. This time around, the long john wasn’t halved and filled with cream. Instead, it was slathered with a thick coating of sweet maple frosting, then topped with two pieces of crispy bacon. With a blend of maple and savory pork in each bite, that variation earned the honor of our favorite donut. But really, we enjoyed every type we tried. Metro Milwaukee might know Aggie’s for its fancy and elaborate wedding cakes, but its donuts also deserve attention. If you ever find yourself in West Allis with a hankering for a high-quality breakfast pastry, stop by the place that’s been baking delicious since 1977.